For someone with strong political views, I try my best to play it fair. With a couple exceptions. 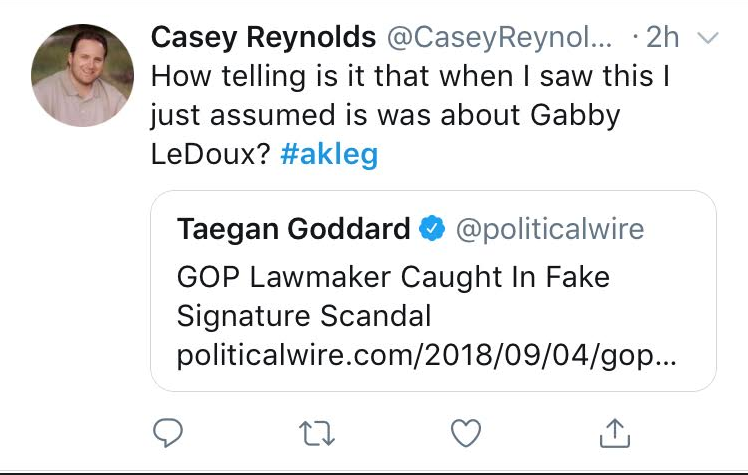 While I don’t count my sick burns every week, I often find more Republicans in my cross-hairs (ACK! Are you still allowed to say that?) than Democrats. 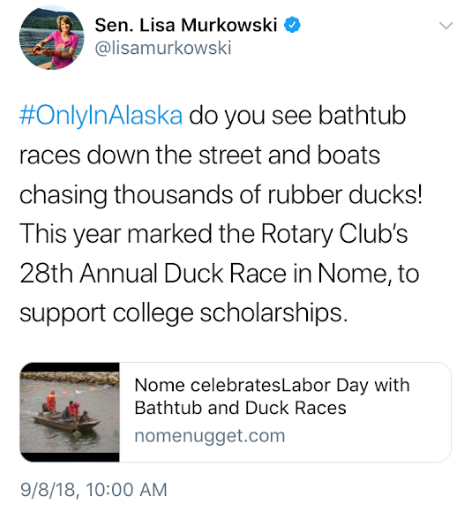 This makes sense as there are more Republican politicians in Alaska than Democrats. For now. That being said, that is not the case this week. 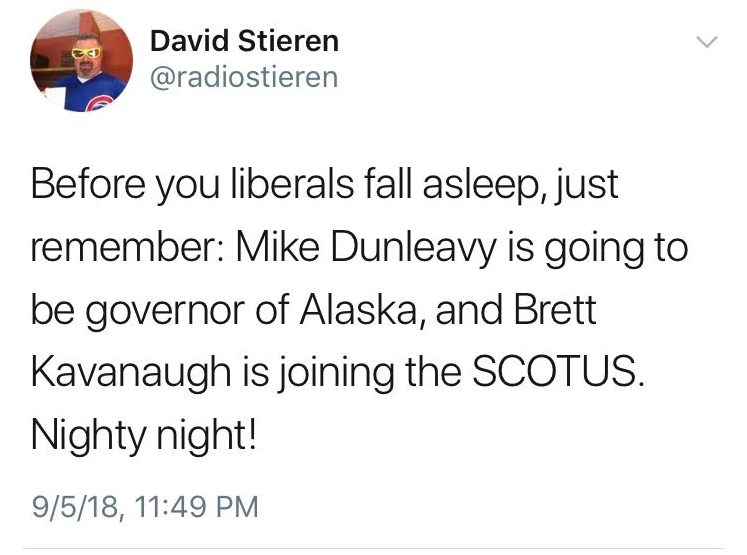 Democrats be warned: this week is all you. If you want to change that, send me more tips. 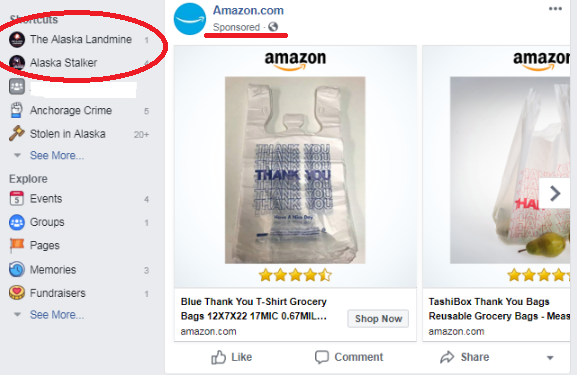 After doing some exhaustive Facebook stalking re: the plastic bag ban, Facebook stalked back and rewarded me with this targeted ad. 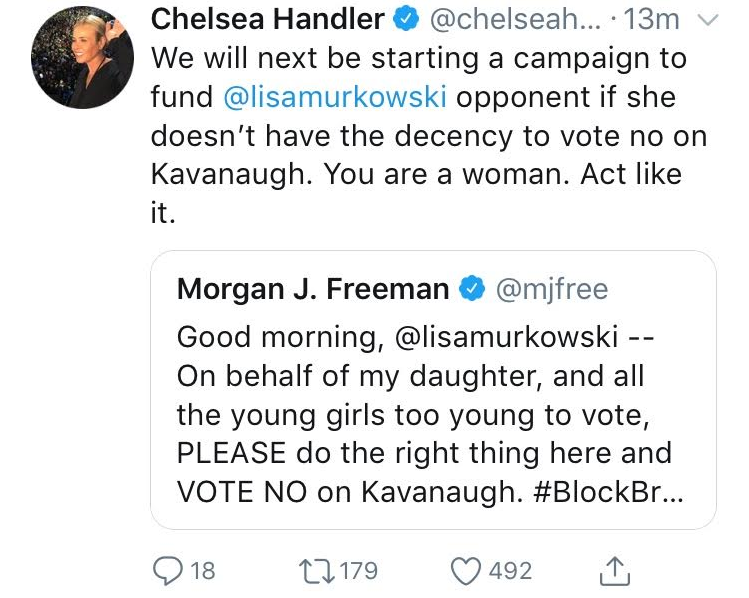 Even celebrities are calling on Senator Lisa Murkowski to vote no on Kavanaugh. You guys. Who’s going to tell them? We’ll let Dave Stieren take this one. 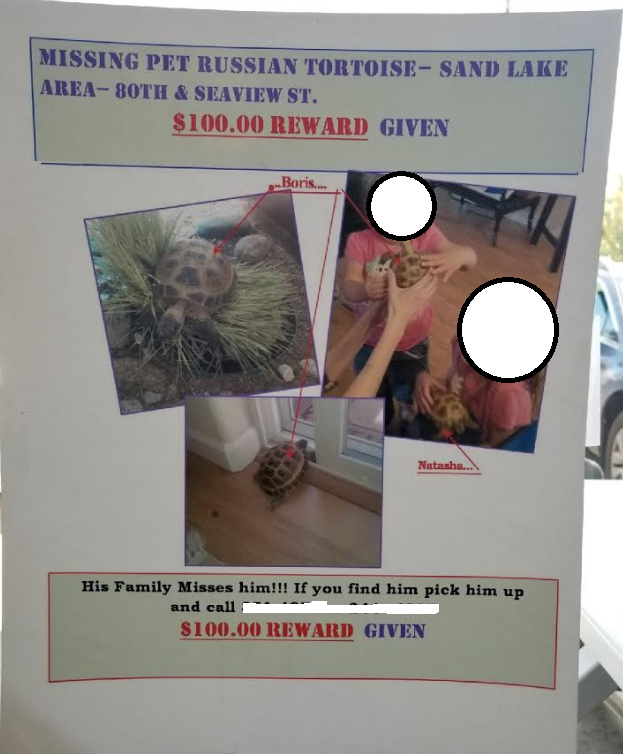 We aren’t that cruel. Wait a minute, is Amy auditioning to fill in for the Stalker while we’re on maternity leave next year? She’s really got our format down. Amy, call us! 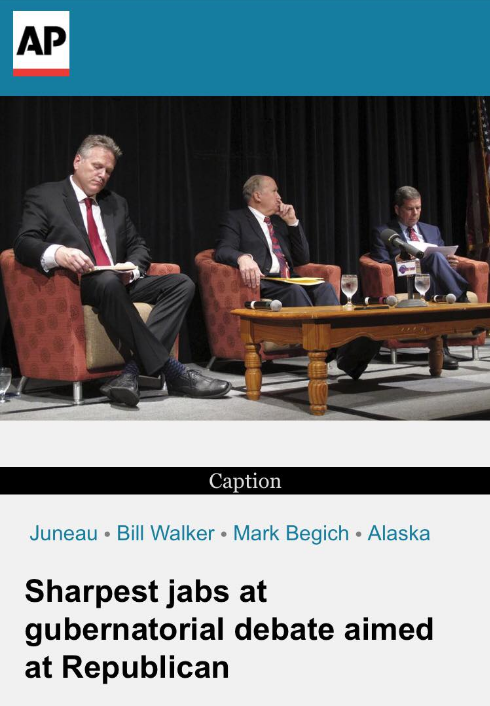 We are living for this amazing photograph from the Juneau Chamber of Commerce Gubernatorial debate via AP. It looks like teeny tiny versions of Senator Mark Begich and Governor Bill Walker are sitting at the kids table fighting over scraps votes. Meanwhile Senator Dunleavy looks as giant as those big budgets he voted for back in 2013 and 2014. Can someone please show this tweet to POTUS? Honestly, we love all of these answers. 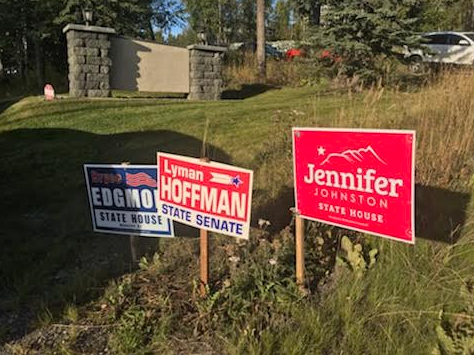 They are right on script for all three gubernatorial candidates. That -4 tho. Best line of the night! 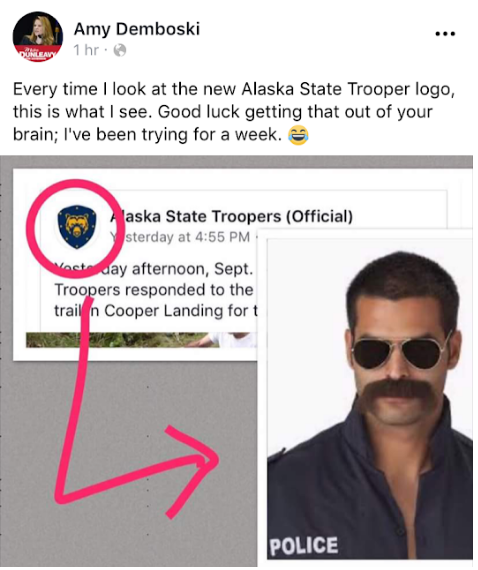 First it was Anchorage Assemblymember Forrest Dunbar and now it’s Anchorage Assemblymember Eric Croft. Yikes! 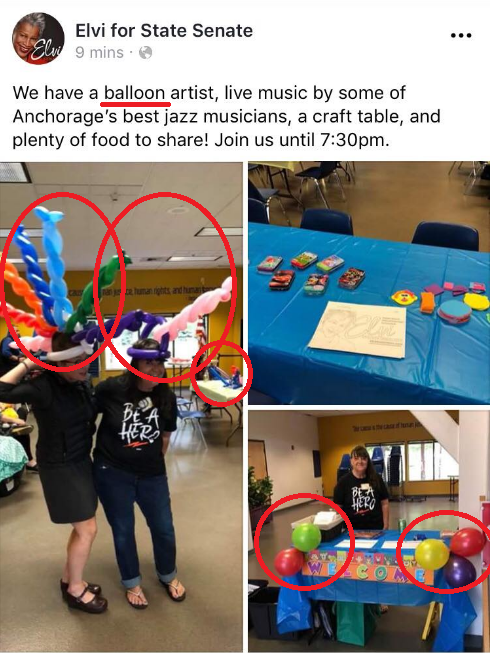 Looks like the Assembly might need to take a field visit to a couple of Anchorage’s finer establishments for some sensitivity training. 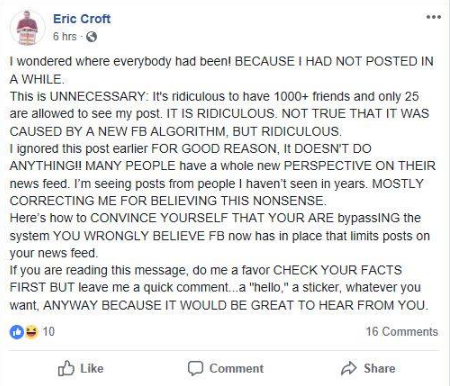 On second thought, has Eric been hacked?! This #fakenews/fishing for comments scam he posted is as old as a Nigerian Prince. Also, You’re left of center Eric. Facebook isn’t censoring you. We promise. 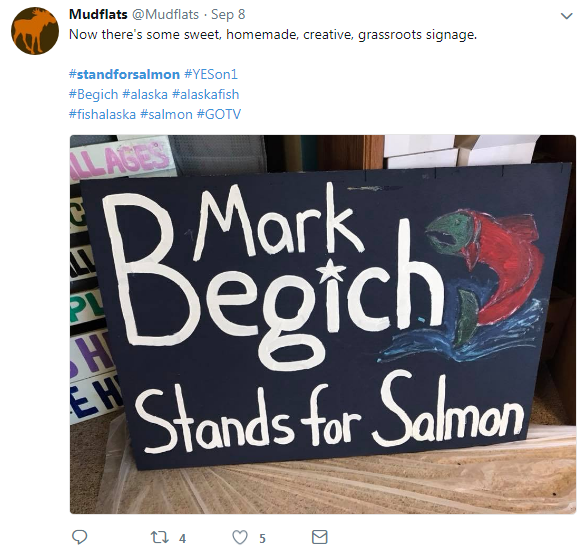 You may have heard the news this week that Gubernatorial candidate, Senator Mark Begich, came out in favor of Stand for Salmon, Yes on 1 ballot measure. 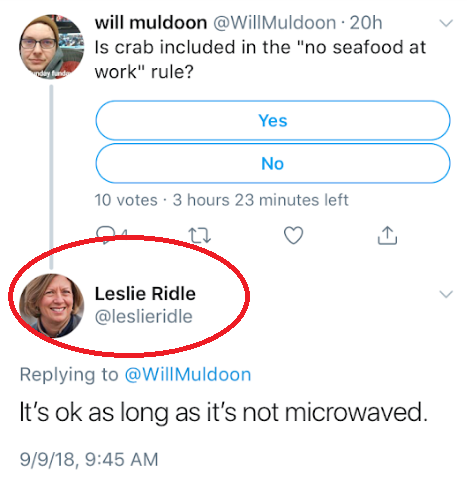 Meanwhile, a top official in the Walker administration, Commissioner of the Alaska Department of Administration Leslie Ridle, has weighed in on another very important seafood issue. 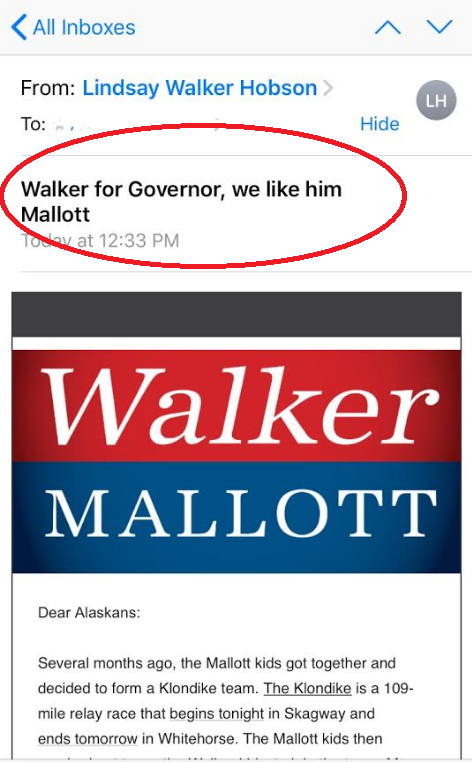 No word yet if this is the Governor’s official opinion. 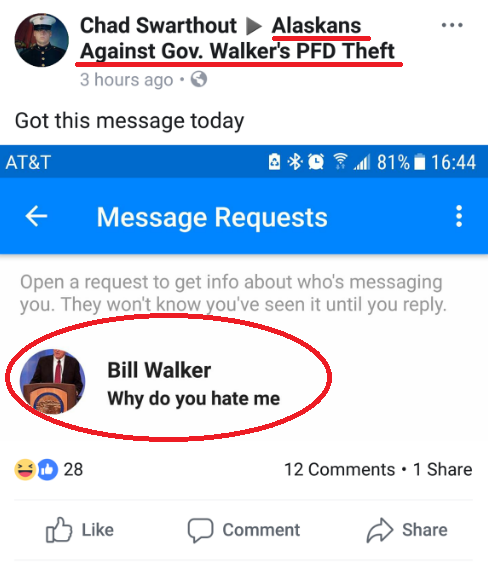 This is a goof, but Governor Walker might want to look into this targeted online campaign strategy. 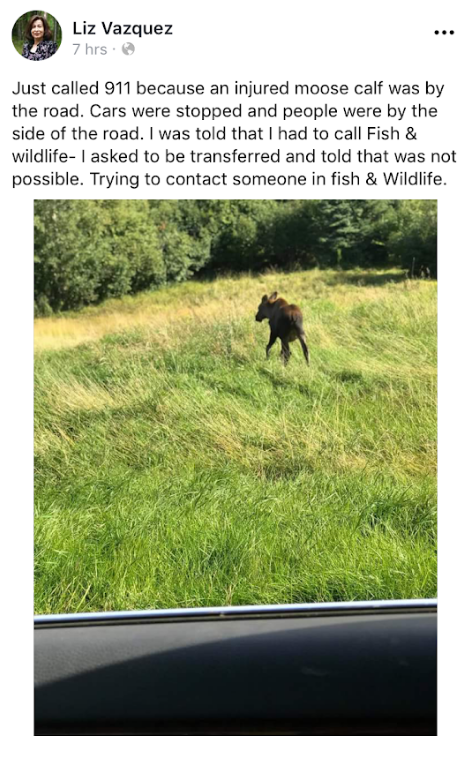 After losing the Republican primary election in District 22, former Representative Liz Vazquez has found a higher calling as a moose mama. According to the comments, Cory from Fish & Game was scheduled to come assess the injury. Fingers crossed for the little one. 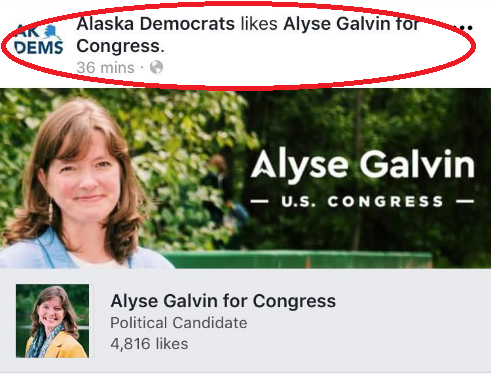 Looks like the Alaska Democrats finally got the memo that candidate for Congress, Alyse Galvin, won the Democratic primary. About time. LIVE at Beluga Point with the belugas! A true Alaskan day on the trail! 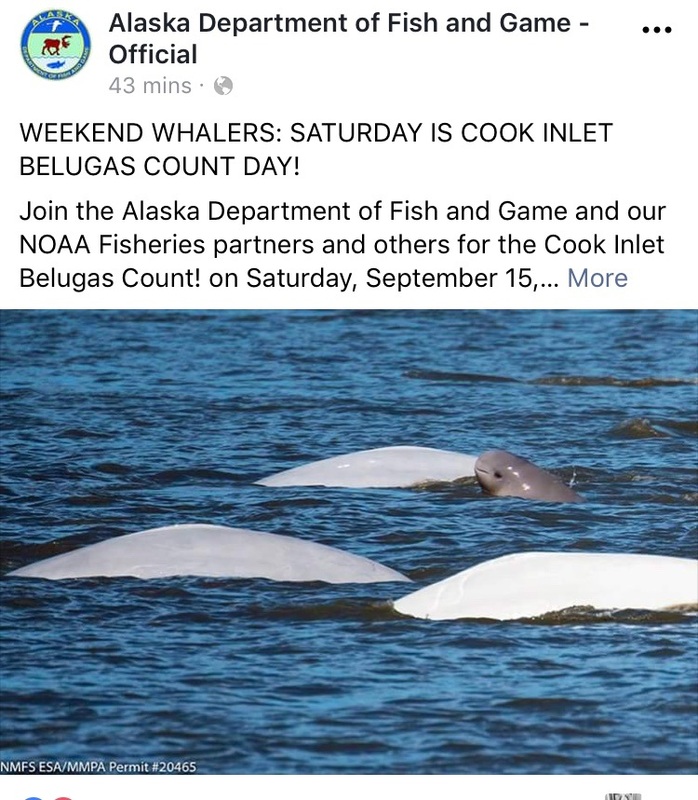 Can someone give Fish and Game a call (Liz, we’re looking at you) and give them a heads up that if Alyse submits a Belugas count to please, disregard it. 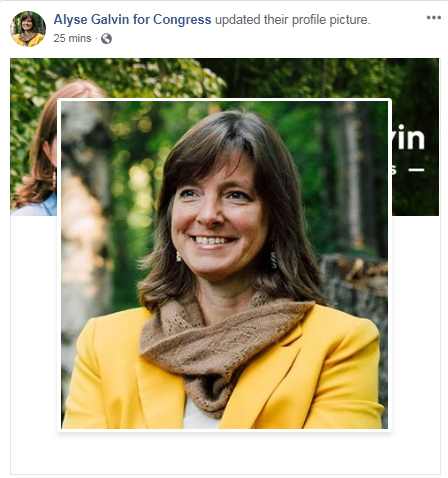 And, earlier this week, Alyse updated her Facebook profile picture. It wasn’t her favorite yellow blazer that caught our eye as much as that qiviut scarf. Daaang Alyse, we’ve seen the prices in Oomingmak. I wonder who in the Galvin family is making it rain? UPDATE: Well, our guess was wrong. But we weren’t THAT far off. LOL. Thanks for the tip Art! You may think we’re picking on Alyse this week. 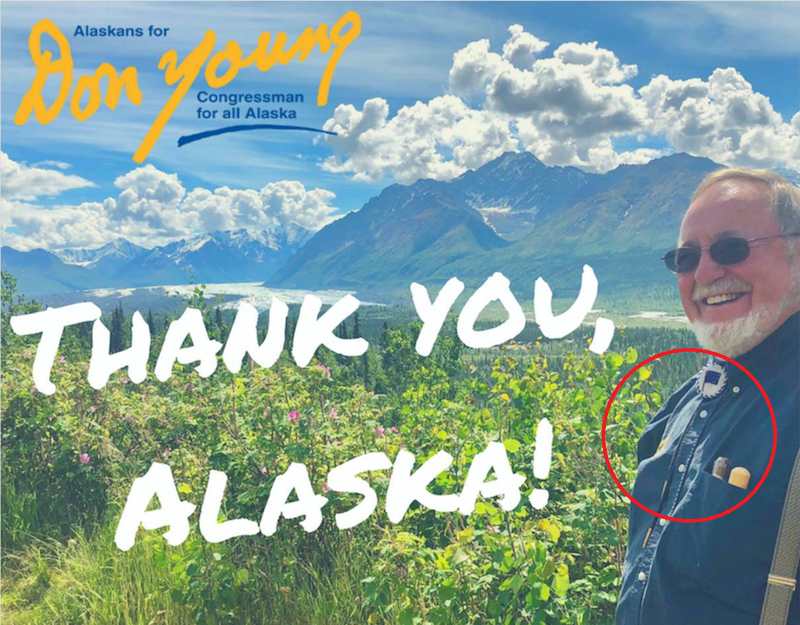 But, with the Anchorage Chamber of Commerce Congressional Debate coming up next Monday, we’re just leveling the playing field for the inevitable “Don Young moment” that we’ve all come to expect. I guess the ACLU is staying out of this one. 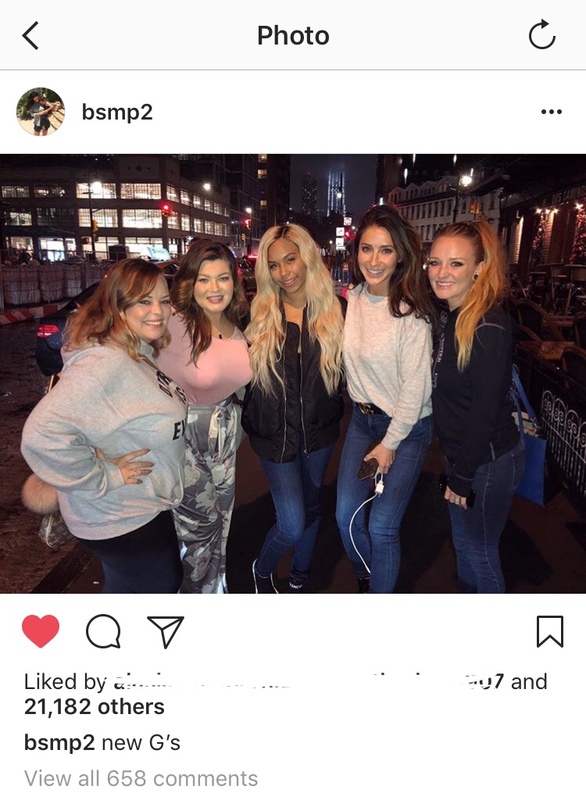 Friendly reminder: a new season of Teen Mom OG, starring Bristol Palin, starts on Monday, Oct 1. And yes, Governor Palin was spotted in the trailer. Note to husband: we need to uncut the cord ASAP. 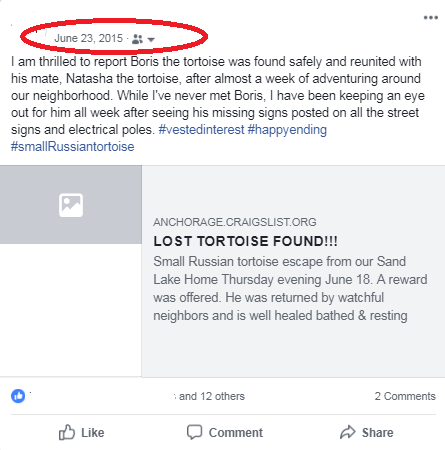 Here’s our social media post on Boris the tortoise from 2015. 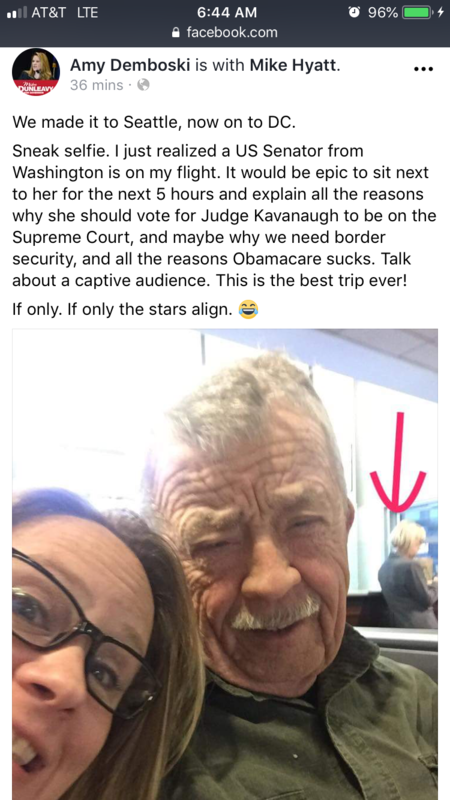 We can’t make this stuff up folks. Scene: A group of politicos discussing the merits of an Alaska Legislature calendar. Overheard at the Anchorage Chamber Gubernatorial Debate: Tina Pidgeon chatting with Jeff Landfield. 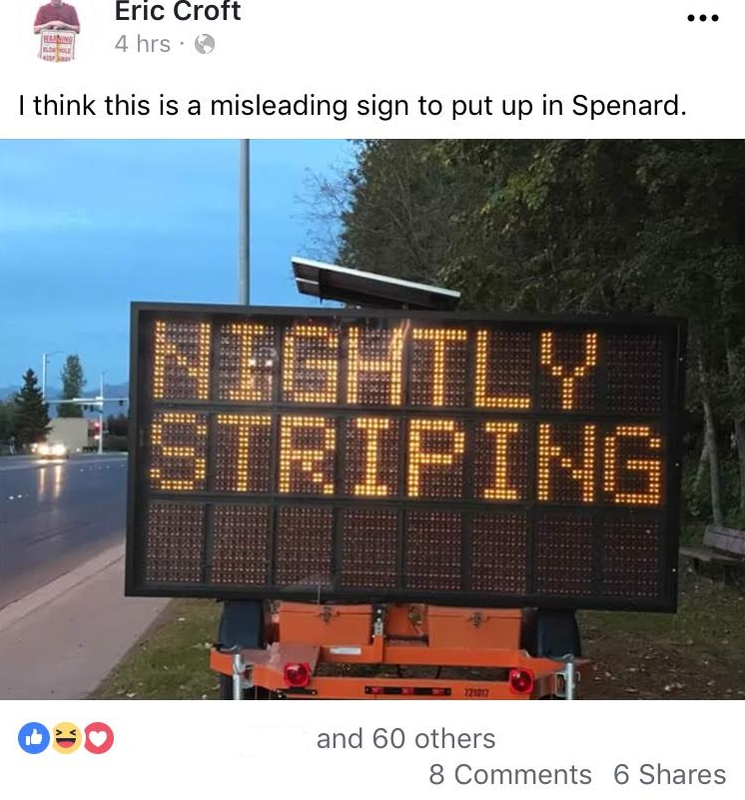 Mark Begich came up to them and said, jokingly, “You don’t want to be seen in public with Landfield!” Tina agreed and added, “Yeah, I might end up in your blog.” Ya think? Hi Tina! Thanks for reading. 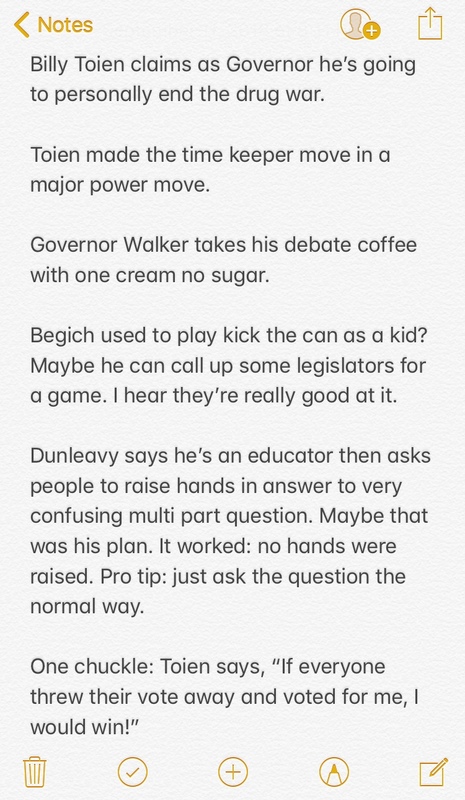 Speaking of the Anchorage Chamber Gubernatorial Debate, here are my actual notes from the event. As you can see, it was pretty uneventful. Overheard at Snow City: Lady talking to her kids or grand kids about how she met President Obama, well sadly former President Obama, at Snow City just a couple years ago. Spotted in Anchorage on Minnesota: An SUV with a Grier Hopkins bumper sticker. Spotted at 40th anniversary of Anchorage and Whitby, England as Sister Cities: Anchorage Mayor Ethan Berkowitz, Anchorage Assemblymembers Eric Croft and Forrest Dunbar, and many Anchorage Sister City Commissioners.